Each year around 350 bull calves are born at DCC. The best result would be to raise all breed improving young herd sires that would sell for high dollar -- that isn't going to happen. But, fortunately some will be national leaders. Here is the shake out. With birth weights, weaning weights, pedigree evaluation, disposition tests and eye ball scrutiny, about 40 of the finest bulls will be grown up and carefully considered for herd sires. Once those 40 leave, 20 more are selected for exhibition steers. This includes steers to show, train to ride or develop as traffic stopping lawn ornaments. These will be selected for color and especially long horn growth. We expect a 4 to 5 year old steer to measure 6 foot tip to tip and go on to 7 or 8 feet at maturity. This group doesn't have to be as correct conformation as the bulls, nor are they required to have great beef conformation. Next is our feeder steers that will go on the tender lean program. About 100 of these are retained on the basis of weight gain only. Neither color or horn have any priority on this cut. The steer herd left go to the roping industry. These calves will grow horn faster than anything else in the roping pen. At weaning time, their horns will be nearly as long as their ears. By a year old, they will develop a great horn base of up to an 11 inch circumference. 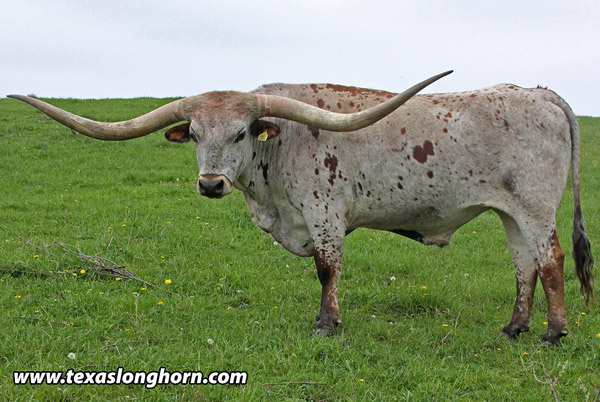 Many ropers cast their horns and start roping them at 9 to 11 months with excellent results. Bronc Fanning, publisher of "The Roping Pen", of Stephenville, Texas (and a whale of a speedy steer roper he is) believes that Longhorns are the best roping cattle in North America. Give Bronc a call and he'll explain why they are the best. Most steer ropers, rope Mexican cattle and think that's all there is. But, there's more to it. 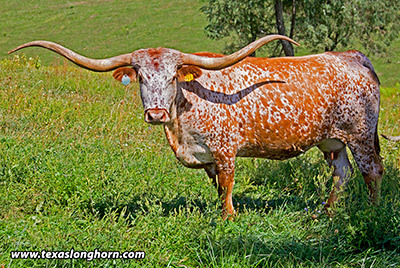 Longhorns grow more horn faster and then when they have finished their rodeo career, they grow out in the feed lot and produce well marbled tender steaks. Some will grow to be recreational steers themselves and pull or ride. Some will become traffic stopping lawn ornaments. 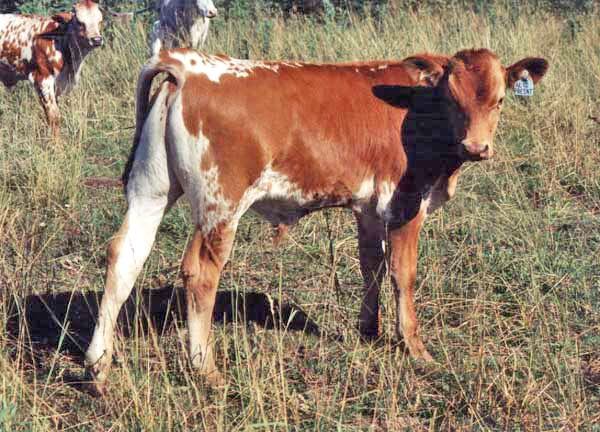 Longhorn cattle are the most versatile cattle on earth. There's more ways to make a profit with Longhorns than Bill & Hillary can find to dodge the law. When the year is finished here at DCC , all the bulls/steers will be placed in their respective speciality job. Attention: Steer ropers and roping producers, we will have a pasture full of steers for you every fall. You won't have to worry about them growing enough horn either -- they will do it. Give us a call to reserve your pen of choice steers. (available Oct/Nov) call early. 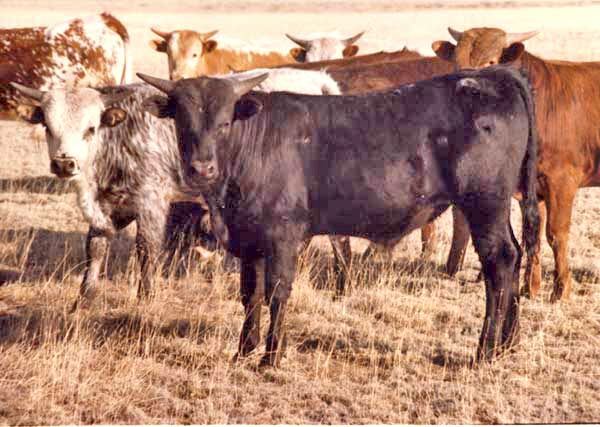 We also have performance tested BueLingo and Longhorn feeder steers, show steers, and exhibition steers deluxe. Give us a call at 740 758-5050. Thousands of weaned, healthy, disease free Texas Longhorn steers like these have been produced by DCC and used by roping producers all over the nation. These are top of the line. At DCC genetics like this cow with over 90" of horn prevent any concern about the horn growth on select DCC steers of a similar bloodline.Fifty one years of measuring and performance testing has created consistency like no other herd. 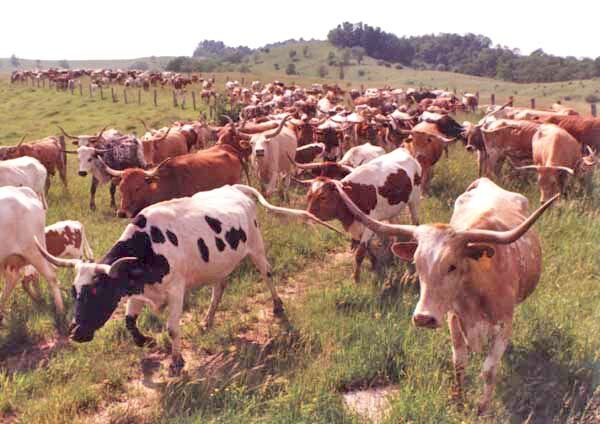 The DCC Texas Longhorn cow herd is the largest quality herd east of San Francisco. It takes a serious approach and large numbers to develope great breeding or recreation cattle. 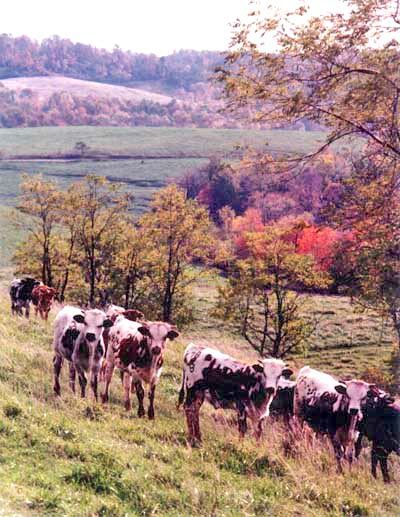 This steers represent the center of the DCC genetics. Every young bull or steer is related in some way to this Championship steer. DCC produces several families of thick beef type feeder calves. They can be purchased and privately fed, or purchased cut & wrapped from DCC . Quarters and halves of corn fed naturally lean Longhorn beef is available on a first-come - first-serve basis. Select the proven healthy choice.